I’m constantly surprised at how many photographers I talk to, who have simply no idea what it costs them to run their business each week. Usually the conversation starts with the photographer moaning about low prices and bargain-hunting photo-buyers, but can we really complain about people not paying enough for our work when we don’t even know how much we need for it to cover our costs? There’s a fair number of online calculators that will help you with this… sites with different Calculators for different photography business models, so we’ve listed the best of them below. If you can’t find one specific to your situation, try a Google search because there’s plenty more out there as well as articles to help you refine the process. This is one of the most comprehensive and will be suitable for most photographers to work on a day rate. This one is quite slick and easy to use and a good place to start if you mostly do assignment work. This one isn’t quite so slick, but it can work quite well for stock photographers if you use the ‘billable units’ field to enter your anticipated stock sales each month. This is a fairly broad calculator, with both basic and advanced modes, covering a variety of business options. If you’ve never done this sort of analysis before, this one has some detailed instructions and background information, and could be a great place to start. While the automatic Stock Photography Price calculator is a great tool and will usually be all you ever need, it’s also important that you understand the way prices are calculated. This helps you anytime you don’t have time to access to the Calculator… and it’s also a big help anytime you’re negotiating with Clients. When you understand the factors that contribute to a price quote, you’re better able to justify and explain them to a buyer. 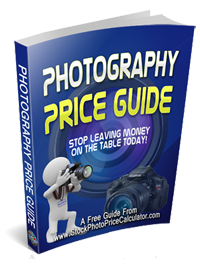 So we’ve put together a short guide to Stock Photography Prices that you can download below. We’ve also included a special bonus report, our do-it-in-your-head Simple Photography Pricing System. That gives you the ability to work out a fair and accurate price, in your head, any time you don’t have immediate access to the Calculator. The only catch is you’ll need to give us a social share or a like on one of the services below! This helps gets the word out about the Calculator, which helps us all, so it’s a great deal all round! This zip file contains both your ebooks in PDF format. Just right-click and save to your computer.